Started pullets are for people who don't have the time, equipment or ability to care for chicks, or who are just too anxious for some fresh backyard eggs to start with chicks! 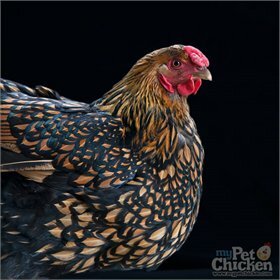 Golden Laced Wyandottes are beautiful and productive birds for the home flock. 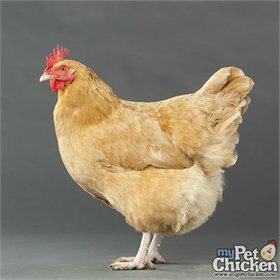 They are a favorite amongst backyard flock owners for their dependable egg laying, easygoing nature and cold-hardiness. Each feather is golden edged in beetle black. The hens look as if they're starlets dressed in sequined gowns, ready for the red carpet and paparrazzi! Wyandottes have a heavy body and small rose comb, which makes them perfect for cold climates: they're not prone to frostbite. The hens are hardy, energetic and faithful layers. All Started Pullets are shipped USPS Express Mail. **Please do not immediately turn your started pullets out with an existing flock. Read why, here. These pullets will be vaccinated for Marek's disease and will be approximately 6 weeks old when shipped.